On March 8, FIRE wrote to University of California, Davis chancellor Gary May in response to reports that professor Joshua Clover was under investigation for years-old comments regarding law enforcement, despite the university’s initial statement upholding his First Amendment rights. UC Davis has now confirmed to FIRE that Clover is not under investigation, an important update given a new resolution demanding Clover’s termination. However, local news subsequently reported that the university’s legal team had begun investigating Clover’s comments. FIRE wrote to the university, explaining that an investigation into protected speech would place the university at odds with the First Amendment. Fortunately, Chief Campus Counsel Michael F. Sweeney notified FIRE yesterday by email that UC Davis has not launched an investigation into Clover’s tweets. Sweeney also reaffirmed the university’s commitment to free expression and its faculty members’ First Amendment rights. Sweeney’s reassurance is especially important in light of California Assemblyman James Gallagher’s recent efforts to pressure UC Davis to fire Clover. 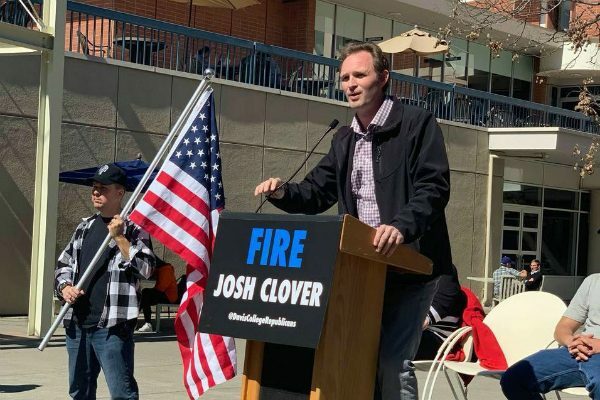 Gallagher promoted a petition demanding Clover’s termination and, upon reaching 10,000 signatures last week, handed out copies of the petition to UC Davis students in front of May’s office. This is not about free speech or academic freedom. It is important to note that incitements of violence are not protected speech under the First Amendment. Calling for the death of a group of people is not a contribution to a discussion; it is the ultimate abolition thereof — to silence the other side forever. Would we tolerate his statements if they were made toward any other identifiable people group? Of course not. We can begin to change the trajectory of our public dialogue by no longer tolerating this kind of invective. UC Davis can act now to take us higher and preserve the values and integrity of this university by terminating Professor Clover immediately. As FIRE explained last week, this is actually about free speech and the First Amendment. Legislators, because of their special duty to uphold the Constitution, must avoid using their elected positions to pressure public institutions into punishing speech protected by the First Amendment. Legislators must reject this resolution as their duty to uphold the constitution cannot be squared with this blatantly unconstitutional effort to pressure a public institution to fire a faculty member for protected speech. It should go without saying, but if the Assembly “supports free speech and the right of professors and students to express different ideas,” it must oppose this resolution, not support it. Ultimately, FIRE is pleased that UC Davis has reaffirmed that Clover is not under investigation, and hopes that universities facing similar controversies in the future will also choose to abide by their legal and moral obligations to free speech and the First Amendment.